The document was supported by 67 UN member states. The Third Committee of the UN General Assembly adopted the updated draft resolution "Situation with human rights in the Autonomous Republic of Crimea and Sevastopol, Ukraine". President of Ukraine Petro Poroshenko commented on the adoption on Twitter. The document was supported by 67 delegations, 26 countries voted against, 87 countries abstained from voting. The press service of the Mission of Ukraine to the UN in its Twitter listed the countries that voted "against": Armenia, Belarus, Bolivia, Burundi, Cambodia, China, Cuba, North Korea, Eritrea, India, Iran, Kazakhstan, Kyrgyzstan, Myanmar, Nicaragua, Russia, Serbia, South Africa, South Sudan, Sudan, Syria, Tajikistan, Uganda, Uzbekistan, Venezuela and Zimbabwe. The document confirms that the forceful seizure of the Crimea is illegal, and is a violation of international law. The point is that the occupied territories must be returned. Concern is expressed that the mission to monitor the observance of human rights in Ukraine is still deprived of access to the Crimea, despite the mandate that covers the entire territory of Ukraine. UN member states strongly condemned Russia's total disregard for its obligations under the UN Charter and international law regarding its legal responsibility for the occupied territory, including responsibility for respecting Ukrainian law and the rights of all civilians. The document calls on Russia to provide access for independent doctors from international medical organizations, as well as to Ukrainian officials to illegally detained Ukrainian citizens in Russia and Crimea. The resolution demanded Russia to stop attracting residents of the annexed peninsula to participate in military operations and stop the deportation of those who do not have Russian citizenship from the Crimea. Russia is also required to comply with the decision of the International Court of Justice of April 19, 2017 on the restoration of the rights of Ukrainians in Crimea. This document will be sent to the UN General Assembly, the vote for the resolution may take place in December. Petro Poroshenko thanked the UN member states for supporting the resolution. “The resolution explicitly mentions the cases of Ukrainian political prisoners of the Kremlin. Our struggle for their freedom goes on. Russia will not escape international responsibility for aggression, occupation and human rights violations, ”the President wrote on his Twitter. 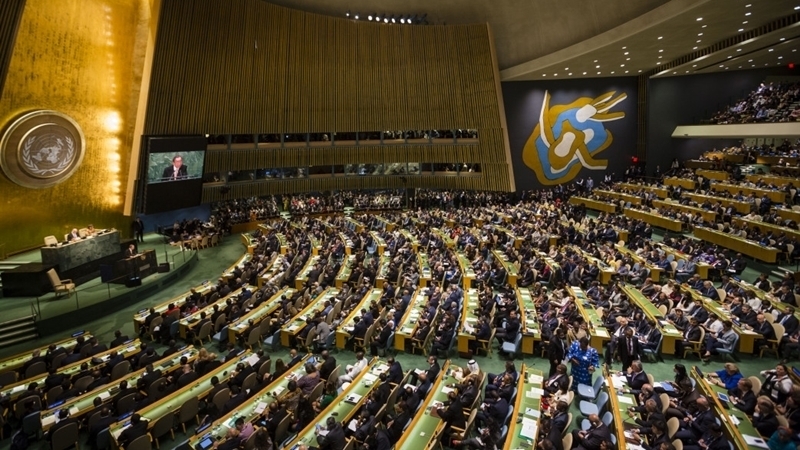 The Deputy Minister of Information Policy, a member of the Ukrainian delegation to the UN, Emine Dzheppar, said that over 30 countries of the world have joined the co-authorship of a special UN resolution on the occupied Crimea. According to her, for the first time in the history of the UN, a country that is a permanent member of the UN Security Council is called in the resolution an "occupier" and an "aggressor."